Just another FREEBIE for ya today. Boy, I'm full of these this week! If you missed yesterday's three freebies, head here to pick them up! Actually, I shouldn't claim today's FREEBIE, as it isn't from me...I'm just passing it along! With all of those colors and icons, I think it's pretty safe to say that if you're in need of these, there's a set that would look FAB on your blog! Just click the image above to head over to her blog and pick these up. Be sure to leave her a "thank you" if you snag them! We're working on Poetry right now. We're reading it. We're writing it. They're even listening to it. Our current read-aloud was chosen for this particular reason. 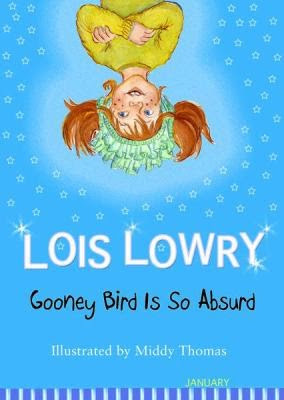 Gooney Bird Greene is one of the first chapter book read-alouds I use in second grade. They love her. She IS absurd! In this follow-up book, Gooney's class is learning about Poetry....they write Haikus, Couplets...my kiddos can relate. But, Gooney Bird....well, just look at the cover. Yes, that is underpants on her head. Well, they used to be underpants. Now, they're a "two ponytail hat." 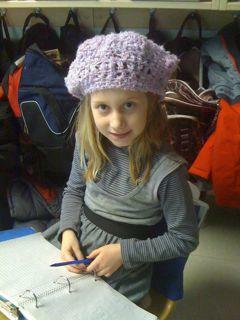 Gooney thinks that this warms up her brain and helps her to be a better writer/poet. 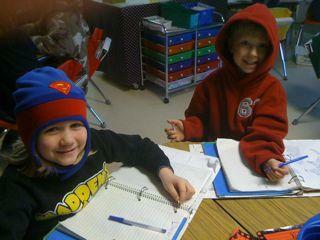 The rest of her class ends up bringing in "odd hats" (head warmers) to help warm up their brains, too! So, once we get to this part (tomorrow), I'll invite my kiddos to bring in "odd hats" (head warmers) to wear while we write poetry. I "tried it" the last couple of years and they ATE IT UP! Seriously....they swore by it. Who knows? Maybe we'll start a new trend. Of course, I made a strict rule about "no underpants." I don't think those would have helped at all. ;) And, luckily it's always chilly in my classroom. We'll see what this year's batch brings in. Anything to get those poetry juices flowing, right?! What a fun idea! We're doing poetry right now - and my fifth graders would LOVE to write with hats on :) It would get their creative juices flowing, I just know it! I love that idea - my class loves any excuse to dress up. Thanks for the heads up on the blog buttons - just so happens I need a new one! We love Gooney Bird! Thanks for sharing the great idea about the hats.